AlfaRichi are at the forefront of technology and it is not surprising that we were chosen by Casio to provide the software and install the first sites with the new VX-100 terminal. 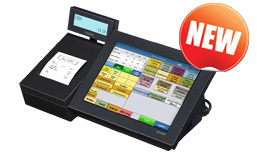 AlfaRichi provides proven EPOS software for Food and General Retail, Restaurants, Franchises, and Mobile sales. The back office is cloud based and accessible from anywhere. The front end software communicates in real time with the back office but continues to work if there is no internet. It is used by customers with from 1 shop to 100+ shops for many years and is now also available on the VX100 Android based POS terminal. AlfaRichi is an approved CASIO partner.